It occurred to me the other day, as I evicted yet another bunch of volunteer ocas from their chosen homes, that I've been doing this for a few years now. In fact the 2014 seedlings are the sixth generation descendants of the original oca varieties that I started with. For those who love this sort of thing, the six degrees of separation theory posits that we are all connected with one another by a chain of, at most, six intermediaries; it's an intriguing idea, the likelihood of which must surely be increasing as the internet's hyphae ramify ever further across the globe. Oh and it was also a passably good film. Here are my ocas - the great, great, great, great grandchildren of the original varieties. They're still going strong, or at least they appear to be if the above image is to be believed. So what effect has being Generation Six had on my charges? But before all that, an extensive caveat. I'd like to be able to say that I've made a significant breakthrough in breeding a ravishingly beautiful, delicious, dayneutral oca. Maybe I have, but due to conflicting pressures and responsibilities, I haven't been been able to devote anything like enough time to the methodical recording of tuber yields. Something or other has got in the way every time - frost damage, voles, vine weevils, midnight ambulance rides to hospital - that kind of thing. That and the more humdrum exigencies of earning money. And when I say breed, I really mean stand and stare at the bees and hoverflies transferring pollen as they flit from flower to flower - very relaxing. Back in the early days, I rushed to hand pollinate and bag flowers individually and I think I even went to the trouble of recording parentage, but I now no longer have time or the inclination for such niceties. If you want to look at someone who's far more methodical than me, check out Bill's blog. Proper breeders are supposed to apply some sort of directional selection pressure to their charges. I've done very little of this, I must confess. There are two reasons: firstly I started with only a few clones and I thought it wise to conserve as much variation as possible before culling ruthlessly. Secondly, I'm a softie at heart and don't like to institute a reign of terror on my charges - I'm not Ivan the Terrible, I'm Rhizowen the lily-livered. Oca seedlings are variable - leaf, stem, and tuber colour, pubescence, height, you name it, it varies. 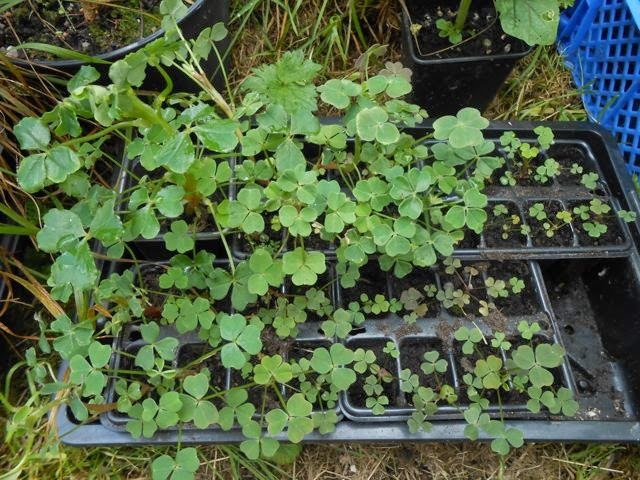 Oca seedlings generally flower much more readily than commercially available varieties. There are many more of the short and mid-styled varieties than long styled ones. Oca seeds germinate fairly easily and grow quite fast; they can go from seed to seed outside in one season here in Cornwall. Tubers from oca seedlings are perfectly edible and not always tiny, knobbly and misshapen. Oca pods require careful management - when they pop, those seeds don't stop. Corollary of the above - oca volunteers will appear where you probably don't want them. Voles and other rodents love to eat oca tubers. Unlike the voles, I hate harvesting oca tubers in the late autumn when our soil is cold, sticky and squelchy. have I been blissfully - inadvertently - purging oca's genetic load, thus producing an oca master race, or merely subjecting the unfortunate plant to the perils of inbreeding, spawning a clutch of web-fingered banjo players? Deliverance from these sorts of questions at three o'clock in the morning would be very welcome. A bunch of ten or more people, ocaphiles to the hilt, with whom to explore some of the possibilities of oca improvement. There are so many questions to be answered, so much more work to do. Until such time as the above dream team materialises, I will ponder and ruminate. So here's my final question, which neither Bible scholars nor oca breeders have yet been able to answer definitively: will the mistakes of the "breeder" be visited unto the seventh generation? I'll let you know - next year. 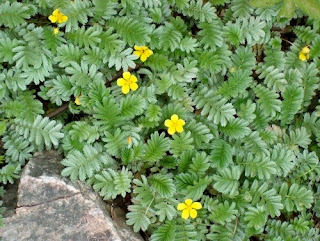 It sounds to me like you are breeding oca more or less as it has been done for thousands of years. Perhaps we are yet to uncover a massive cache of Inca breeding records, but I suspect not. You have a naturalized, self-sustaining, sexually-reproducing population of oca in the UK. Who needs paperwork? It sounds to me as though you've been selecting for oca which set seed reliably in our climate. That's a good start. Now I've solved the waterlogging problem, I could have a go with them next year if you like. Still falling over my own feet just learning how to grow oca - impressed as ever - don't give it up! hi there - stumbled across your blog whilst looking for rare tubers in the UK. I am in awe and absolutely inspired - i'm in central London so dont have growing space but soon going to do something about that. i'm a rare tuber fanatic, try to source as many varieties of yam, sweet potatoes, cassava, etc as I can. Plus breadfruit, rare gourds and other allsorts. However i have never tried Oca or Mauka. I wondered if you would be kind enough to sell me some of anything you have available? would be much appreciated. I've grown oca for two years now using the tiny pea sized tubers for the next generation. It works OK and I grow in large pots so I can carry on growing them somewhere warm when it gets cold here but I've not seen flowers or seeds on them yet. So I am very jealous to here you have an abundance of flowers on yours. I got my original tubers from Realseeds. Oh and do you think one of us will ever be able to grow a non daylight sensitive variety if we keep growing them year on year? I have to confess that we've pretty much given up on oca from seed to concentrate on improvement through tuber selection. We've found that with most of our varieties 4 - 5 years of consistently selecting and re-growing from the plants with the largest tubers gives us a reliably productive crop that is reasonably evenly sized and decently large (I look for around the size of a pink fir apple spud as a minimum). I'm the grower, not the geneticist here (I just want good usable varieties for the kitchen) but Ben did have a selection of theories about it! Now I want to see your 6th generation oca! There is a point on the untravelled path when you think "When the heck am I going to get there?" And suddenly you find yourself surprised to arrive at your destination. In other words, I'm looking forward to seeing your excellent results and support your oca mania.